The HPE StorageWorks Ultrium 460 Tape Drive is the next generation of HP's Ultrium tape drive family delivering a capacity of 400 GB (assuming 2:1 data compression) on a single cartridge. 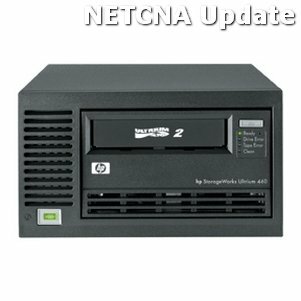 Reinforcing HP's leadership position in tape it builds on the success of the HPE Ultrium 230 and HPE Ultrium 215 drives providing unprecedented levels of performance capacity and reliability and setting new standards in the superdrive tape market. With a transfer rate of 60 MB/sec the Ultrium 460 is the ideal choice for enterprise-class data protection needs particularly where the backup window is shrinking.? ?The Ultrium 460 tape drive is fully read and write compatible with the first generation of Ultrium tape drives while setting new standards for performance capacity and reliability. As part of the four-generation LTO Ultrium open format the Ultrium 460 offers customers the best choice and investment protection. The HPE StorageWorks Ultrium 460 Tape Drive is the next generation of HP's Ultrium tape drive family delivering a capacity of 400 GB (assuming 2:1 data compression) on a single cartridge. Reinforcing HP's leadership position in tape it builds on the success of the HPE Ultrium 230 and HPE Ultrium 215 drives providing unprecedented levels of performance capacity and reliability and setting new standards in the superdrive tape market. With a transfer rate of 60 MB/sec the Ultrium 460 is the ideal choice for enterprise-class data protection needs particularly where the backup window is shrinking.? ?The Ultrium 460 tape drive is fully read and write compatible with the first generation of Ultrium tape drives while setting new standards for performance capacity and reliability. As part of the four-generation LTO Ultrium open format the Ultrium 460 offers customers the best choice and investment protection.